Mr Stewart Stevenson MSP, Minister for Transport, Infrastructure and Climate Change, spent an afternoon in Glasgow hearing about our partnership led plans to revitalise and regenerate the Clyde Corridor, a national regeneration priority for the Government. This visit also provided us with the opportunity to reaffirm how our regeneration and development activity, in complement to our other activity, is tightly focused on supporting the Scottish Government’s five Strategic Objectives and local authority single outcome agreements. Indeed, our regeneration and development activity is led, where possible, with local authority partners. In Glasgow, Gerry Gormal of Glasgow City Council and Gary Watt of ISIS, joined us in showing the Minister the vibrant and community-focused enhancements proposed with our award-winning masterplans for Speirs Locks and Maryhill Locks, which were recently recognised as ‘exemplary’ in the Scottish Government’s Scottish Sustainable Communities Initiative. We also took the opportunity of outlining our aspirations for a footbridge linking communities in Maryhill. The proposed footbridge will be ‘held aloft’ by a landmark 30 metre Bigman sculpture by renowned local artist Andy Scott. Following an earlier trip to Muirtown Wharf, Inverness, where we outlined our aspirations to create a bustling canal quarter linked to the heart of the city, Mr Stevenson also visited Fort William. Here, he travelled by boat to see the Telford House and new facilities at Gairlochy. The Telford House is one of a small collection of historic properties, including the striking Bona Lighthouse near Fort Augustus, which we hope to refurbish and sustain as heritage holiday lets in the near future. Again, our welcome party here was well supported by partners including Highlands and Islands Enterprise, the Highland Council and VisitScotland. The Railway Benefit Fund (RBF) raised in excess of £18,000 at its annual Scottish Charity Dinner; the most raised in the three years the event has been running. Held at the Glasgow Science Centre on Friday 28 August, 2009, the event was attended by the guest of honour Stewart Stevenson, Minister for Transport, Infrastructure and Climate Change, Sir William McAlpine, the Fund’s president and Lady Judy, businesses and rail related organisations and was compared by the renowned Scottish referee and lawyer, Willie Young. “I’m was delighted to have been invited to the Railway Benefit Fund’s third Annual Scottish Dinner and see for myself the excellent work they do supporting railway staff, their families and dependents. During the evening, guests experienced a hands-on reception with science experiments, flame shows, dinner and ceilidh dancing music from the ever popular Glasgow band, Blaze in the Bothy. The RBF also screened its short charity film for guests. To view an excerpt, please visit http://www.railwaybenefitfund.org.uk. The funds raised will help the charity provide support to the young and old, active or retired workers connected to the railways. In the last year, the RBF made grants of roundly £500,000 to help more than 700 families across the UK. Banff & Buchan MSP Stewart Stevenson has welcomed NHS Grampian’s announcement that specialist exercise classes for people with Diabetes are to be launched in Peterhead on the 2nd of September. 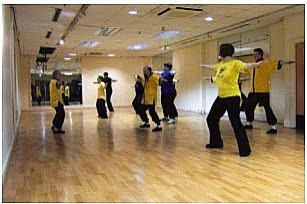 The classes aim to encourage people to eat healthily, take appropriate exercise and gain a better understanding of their condition. They will run for 90 minutes, with around 50 minutes of exercise followed by a lifestyle discussion and will have a specially trained cardiac instructor with diabetes knowledge on hand. “The launch of these specially designed exercise classes in Peterhead is extremely good news for people with diabetes in the area. By doing more carefully monitored exercise, people with diabetes will be able to improve their fitness levels and quality of life while having experts on hand to support them. “These classes will also help to provide information to people with diabetes that will help them understand their condition and what other steps they can take to see their health improve further. "We welcome the publication of this report and its potential to feed into the Government's future thinking on rail requirements. "The Scottish Government has an ambitious vision for Scottish transport and we have long advocated the need for high speed links from Europe and London not to stop at Leeds but to continue north to Scotland. I have discussed this at length with UK Ministers and there is no doubt that such links would bring significant economic and environmental benefits. Improved journey times could provide significant benefits to Scotland's economy, while also improving connections and opening up new opportunities. Cutting journey times between Scotland and London to below the three-hour mark would also offer direct competition with air travel and could result in helping us towards achieving our 42 per cent cut in emissions as set out in our world-leading Climate Change (Scotland) Act. "Earlier this year, Lord Adonis asked High Speed 2 (HS2), the company formed to progress UK high speed links, to examine the potential for expanding high speed services to Scotland. In June, in response, the Scottish Government announced the setting up of a business team which will allow us to produce a fully developed business case to advance our argument for high speed rail to be extended to Scotland. "It is important to stress that high speed cross-border rail routes to both Glasgow and Edinburgh should connect with the existing network in Scotland to ensure all parts of the country benefit. "It is equally important that HS2 works up a fully developed case for a high speed rail project that links Scotland to the major capitals of Europe. "If, as research suggests, up to three times as many passengers will be travelling on our railways by 2020, then it is important that we move quickly in planning today for the rail network of tomorrow. The Scottish Government is committed to ensuring Scotland's voice is heard in this work and we now look forward to working with the UK Government on the development of a UK-wide network of high speed services." 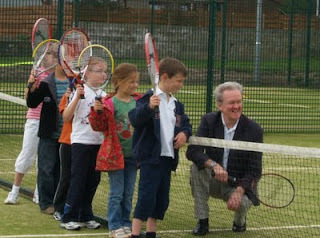 Banff & Buchan MSP Stewart Stevenson officially opened Cruden Bay's new all-weather sports facilities on Saturday. Also in attendance on the day were Peterhead South & Cruden councillor Stephen Smith and SNP Westminster candidate for Banff & Buchan Eilidh Whiteford. The project to refurbish an existing all weather court and to install a new all weather court has cost £115,000. The contributors to the project include SportScotland, Aberdeenshire Council, SITA Trust, Cruden Bay Tennis Club, Cruden Bay Community Association, Brambles PLC and Cruden Bay Recreation Park Committee. The new facilities are part of the ongoing regeneration programme at Mill Park which over the last few years has seen the completion of a new Bowling Pavilion, new Community Pavilion, additional play equipment and upgraded parking and drainage system. Sportscotland, Aberdeenshire Council and SITA have been active partners in all or some of these projects. “This is an excellent addition to the facilities already in place in Cruden Bay and the Recreation Park Committee and all those involved in taking this project forward are to be congratulated on their initiative. "This is a tremendous boost to the village which now boasts an excellent range of sporting facilities for all ages. It's been a terrific effort by those involved with the Park Committee to go out and secure funding for this and I'm delighted their efforts have paid off." Local MSP Stewart Stevenson will officially open the new all-weather courts at Mill Park, Cruden Bay tomorrow (Saturday) at 12.30pm for 1.00pm. Mr Stevenson has been invited by Cruden Bay Recreation Park Committee to officiate at Saturday’s opening ceremony. Banff & Buchan MSP Stewart Stevenson and North-east MSP Maureen Watt will officially start the BRG – Broch Rosehearty Gamrie – Coastal Challenge tomorrow (Saturday) at the Beach Promenade, Fraserburgh. The event aims to raise funds for Macmillan Cancer charity and takes place over the 17 miles from Fraserburgh to Gardenstown. Stewart Stevenson will start the walking race at 10.00am while Maureen Watt will start the running race at 12.00pm. Owing to the recall of Parliament announced for Monday 24 August, surgeries scheduled to be held that day by Stewart Stevenson MSP as part of his surgery tour in his mobile office have been postponed. Surgeries scheduled to take place on Wednesday 26, Thursday 27 and Friday 28 are unaffected and will go ahead as planned. An alternative date will be found in the near future to rearrange the surgeries for the communities affected, which are: New Pitsligo, Strichen, Memsie, Rathen, Lonmay, New Leeds, Fetterangus, Old Deer, Stuartfield, Auchnagatt, New Deer and Maud. 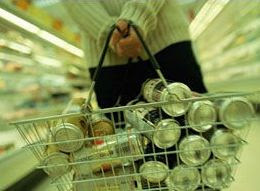 “Cross party support for minimum pricing is very welcome. 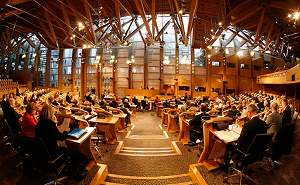 As with the smoking ban approved in 2005, the Scottish Parliament has the opportunity to lead the way by introducing a measure to boost public health and tackle alcohol misuse. “Minimum pricing will target the high-strength, low-cost products causing the most damage to our health and communities, while leaving responsibly-priced products untouched. Moderate drinkers have nothing to fear from minimum pricing, and in fact stand to gain if we can cut the £2.25 billion cost of alcohol misuse which is adding £500 to the tax bill of every Scottish adult. "The Scottish Government is committed to doing everything that it can to help people in this current economic climate and ScotAction is the Scottish Government's skills support package for providing real financial support to businesses and individuals through the recession. "Apprentices are vital for Scotland's recovery. That is why the Scottish Government announced a huge increase in funding of £16 million for 7,800 new apprenticeships this year. "Our whole economy has faced massive challenges over recent months. The retail sector has been far from immune – but its future success will be absolutely vital to our economic recovery. That is why we want to ensure that those entering the sector develop the necessary skills to succeed. "The action that the Government has taken to support Modern Apprenticeships demonstrates that where they have the powers, they can deliver for the people of Scotland – and deliver quickly." Local MSP Stewart Stevenson has announced details of his ninth annual surgery tour of Banff & Buchan communities. And on Day Three of his tour, Mr Stevenson will have clocked-up 600 surgeries since he was elected in 2001. The SNP MSP will be visiting 44 towns and villages in his marathon surgery tour over the next week. 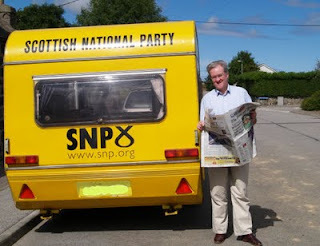 Mr Stevenson’s Mobile Office will criss-cross the constituency, from Inverallochy to Forglen and Sandend to Cruden Bay. The surgery tour kicks-off on Monday 24 August in New Pitsligo and finishes in Tyrie on Friday 28 August. A series of community information displays setting out landscaping and other mitigation measures to be introduced once work commences on the construction of the Forth Replacement Crossing will be open to the public this week. The displays will be on show at various libraries and community centres in the vicinity of the work and highlight the project developments following feedback received since the public exhibitions in January this year. Guidance on compulsory purchase, compensation and the parliamentary process for the project will also be available. Stewart Stevenson, Minister for Transport and Infrastructure, said: “We are now entering the final designs stages of the project, prior to putting forward our final proposals for the Parliamentary Bill later this year. “Since January, we have been developing the mitigation and landscaping proposals, taking on board views received through the exhibitions and meetings held with residents over the summer. “The Scottish Government will deliver a new Forth Crossing on time and on budget using our own resources by 2016 at a cost of between £1.7 - £2.3 billion and public engagement continues to be at the heart of how the scheme is being developed. While interested parties will be able to view the displays for two weeks from Wednesday at a variety of locations, the content for the displays will be available on the project website – www.forthreplacementcrossing.info – from Wednesday for those unable to attend. Banff & Buchan MSP Stewart Stevenson has welcomed the announcement that Fraserburgh is to receive £255,000 from the Scottish Government’s Town Centre Regeneration Fund. The money will be awarded to the Eyesores Remedy Project to turn two properties that have been vacant for some time into an office location and community space. “I am delighted that Fraserburgh is set to benefit from the first round of funding from the Town Centre Regeneration Fund. Given that towns across the country have been applying for a share of this cash, this bid must have been exceptionally strong. “Town centres are the hubs that bring communities together in towns across Scotland and a healthy, vibrant town centre is essential to the success of any town. “I have real hopes for what this money will do for the centre of Fraserburgh and I know that residents there will be looking forward to what will be achieved by it. The SNP Government is clearly once again delivering for people in Banff & Buchan. 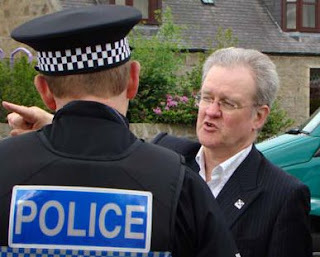 Banff & Buchan MSP Stewart Stevenson has welcomed figures recently published in a written parliamentary answer that demonstrate funding for alcohol services has nearly tripled since the election, from £699,000 in 2006/07 to £2,014,386 in 2008/09. “These figures are a clear indication of just how seriously the Scottish Government takes the endemic problems called by alcohol misuse. It is a problem that costs the police, health service and others billions of pounds a year and has an incalculable human cost for those who lose a loved one as a result of alcohol. “I am glad that the Scottish Government is continuing to show leadership on the issue with funding increases on this scale and the range of other proposals currently under consideration to address the problems caused by Scotland’s relationship with alcohol. "I very much welcome the Convener's confirmation that the Committee will consider an inquiry into the Scotch whisky industry. When Diageo, one of the major players in the Scotch whisky industry, plans to shed so many jobs and ditch 200 years of heritage I believe it is right that they account to the wider community for their management of one of Scotland’s most important industries. 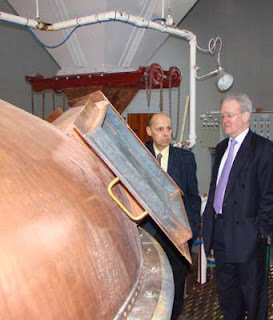 "Whisky forms a significant component of Scotland’s and the UK’s exports. And Scotland as the base of operations gives the Scotch whisky industry a major competitive boost in global markets in terms of reputation and brand loyalty, and I hope that the committee will be able to quantify such factors. It is right that the Scottish Parliament seeks to inform itself about the strategic direction of the industry and the issues it faces in growing its exports in the face of global competition. "These are just some of the overall issues I hope the Committee will be able to investigate and I look forward to a positive response to their considerations for an inquiry." Further steps to support economic recovery by the water industry have been announced by Infrastructure Minister Stewart Stevenson today. The length of the next water industry regulatory period is to be extended by a year to 2015 to give households, and businesses more certainty about future charges and ensure the civil engineering industry is provided with a steady rather than fluctuating flow of work. Changes to the way businesses are charged for their surface water drainage, due to be introduced in 2010, are also being delayed to help avoid unnecessary disruption during the economic downturn. "During these difficult economic times, we are determined to work with businesses and individuals to ensure they get the help they need to address the difficult challenges ahead. "Average household charges in Scotland are already lower than in England and Wales. These changes will give customers greater certainty on charges and enable Scottish Water and the construction industry to plan more effectively for the future. Maintaining a framework of stable and affordable charges while improving levels of service will continue to be a main priority for the industry. "We consulted key business organisations widely on our proposed changes to surface drainage charges and many made the case for a delay. We have listened to those views and believe deferring the introduction will minimise disruption to business customers during this current downturn." "These measures are encouraging and timely, and will provide business customers with extra certainty over future water bills at a time of considerable uncertainty for many firms, who are battling the economic downturn and the challenges of managing cash flow." The Climate Change Scotland Bill has been granted Royal Assent and will now become an Act of Parliament. Climate Change Minister Stewart Stevenson said the legislation now means Scotland is a world-leader on action against climate change, one of the most serious threats facing our world. “The Scottish Government recognises that climate change will have far reaching effects on Scotland's economy, its people and its environment and is determined to play its part in rising to this challenge. Mr Stevenson has pledged to share Scotland’s forward-thinking strategies with the rest of the UK and also with the rest of the world at this year’s UN climate summit in Copenhagen in December. Transport Scotland is continuing its investment in the central motorway with a further £4.4 million upgrade to the M8 between Junction 5 (Shotts) and Junction 6 (Newhouse) starting with the first of three phases on Friday 14 August for two weeks. By the time the current programme for this route is achieved in 2011 over £21 million will have been committed since 2007. This latest phase of works will involve upgrading and resurfacing the eastbound carriageway between Newhouse and Duntilland. And with almost 57,000 vehicles using this section of the M8 daily, operating company Bear Scotland is aiming to keep drivers informed by launching the first-ever Twitter page for road works in Scotland. “The heavy volumes of traffic that have used this road on a daily basis since it was built in the 1970s have resulted in sections of motorway becoming worn over time. It is essential that we carry these works out now to ensure the M8 remains in good working order for years to come. Log on to the Twitter site and search for http://twitter.com/M8_Jct5_to_Jct6 to become a follower and get regular updates about the works. Drivers can also visit www.trafficscotland.org in the normal means for real time journey planning advice across Scotland’s trunk roads. The second and third phases of works are planned for the autumn which will see further upgrades take place on the eastbound carriageway between Duntilland and Blairmains and the westbound carriageway between Duntilland and Junction 6 at Newhouse. Further new measures to create a more effective planning system to support economic recovery come into effect today. “The Scottish Government is working to ensure Scotland’s planning system is increasingly joined up, providing greater certainty and speed of decision making for developers and communities. "These procedural changes form a significant part of our ongoing work to modernise the Scottish planning system, building on advances like ePlanning, the second National Planning Framework and the commitments in Delivering Planning Reform. “The creation of local review bodies will enable planning appeals for small developments to move more swiftly through the planning system – rather than the matter requiring consideration by Ministers. “Pre-application consultations will require developers to consult communities with proposals for national and major developments, increasing public participation in the planning system.